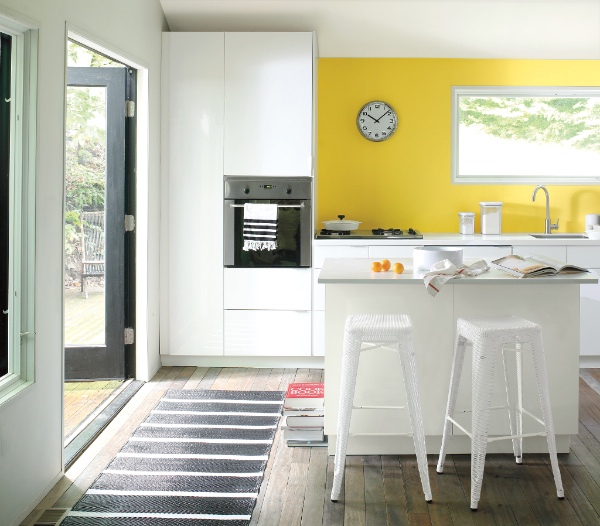 'Banana Yellow 2022-40' provides a fun burst of colour in this modern kitchen. Cut into the white with our 2016 Trend Palette high chroma colours. Punctuating a black and white landscape, high chroma accents sharply define the modern and simple scheme of this digital designer's home. Pops of primary colours from the Benjamin Moore 2016 trends palette are combined with carefully placed black accents and white walls and surfaces to direct the eye and create a strong design statement. A dash of Banana Yellow in the kitchen breaks into the crisp white hue of the cabinetry and worktops to create an invigorating setting whilst the intense yet deep tone of Patriot Blue perfectly complements the cool Ice Mist walls of the corridor and the opaque Black Ink frame of the front door. Featuring graphic lines and opposing bright tones throughout the home, Ravishing Red brings a warming energy to the dining space. Making a powerful statement, this eye-catching hue adorns not only the side wall but also the outline of the large window, beautifully framing the rural scenery. Sitting perfectly against the Paper White wall and ceiling, the black contemporary dining chairs add that final touch of contrasting beauty. 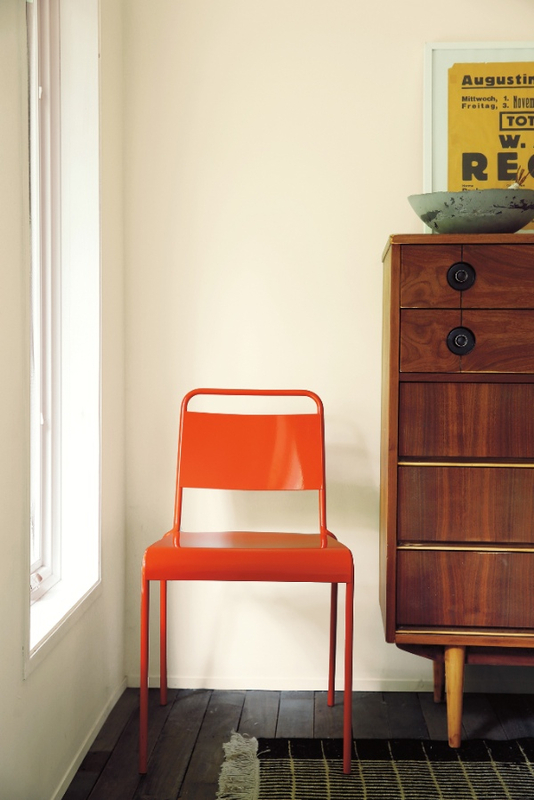 Add personality and dimension with a colourful accent wall and dark chairs against a white backdrop. Benjamin Moore designers chose 'Ravishing Red' next to 'Paper White' in our Aura paint for this striking look. 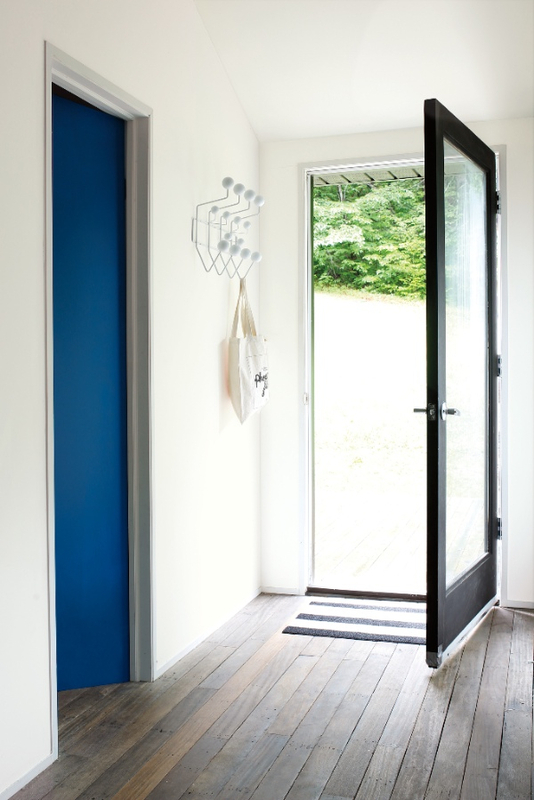 Lay all your cards on the table from the start with a bold entryway. Use 'Royal Flush' in our Natura product and *Mascarpone' to help to level out the flow, while 'Ballet White' provides the perfect balance for the woodwork & door colour. Used either as focal points or accents, this home demonstrates how the use of colour with white in well-considered proportions can be successfully stylish. As white is cut with vivid colour, striking contrasts and bold lines outline the angles and edges in each room of this contemporary home, taking a simple and pared back scheme to a new level. A few bold accents paired with 'Simply White' are all you need for this minimalist look. This home's angles and edges become sharply defined as white is cut with black. Benjamin Moore is famous for the depth and beauty of its colours. The go-to brand for designers in North America, who know they can trust Benjamin Moore to deliver the same outstanding tone, intensity and durability no matter which colour they choose. Similarly, whilst UK painters may shudder at a bold scheme, their US counterparts know they can trust Benjamin Moore to deliver outstanding hide and touch up even in the most vibrant shades. Underpinning all of the fantastic Benjamin Moore product lines is the proprietary Gennex® Waterborne colourant technology. All Benjamin Moore paints are custom mixed, giving customers access to an unrivalled palette of colours. Gennex® colourants fortify the paint to enhance colour durability for a long lasting and resilient finish.